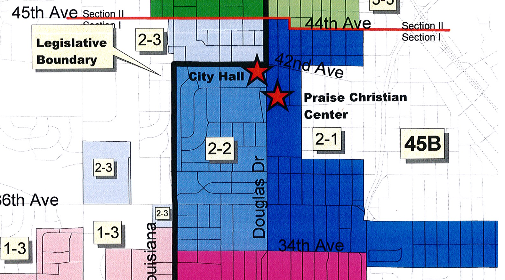 Crystal’s Ward 2 encompasses most of the area south of 45th Avenue and north of 34th Avenue. Ward 2 includes all or part of the Brownwood, Fair, Forest, Welcome Park, Valley Place, Basset Creek, Lee Park, and Winnetka Hills neighborhoods. Want to know which neighborhood you live in? Check out this map. City Hall, the Hennepin County Library, and West Metro Fire-Rescue Station 2 are located in Ward 2. The business districts at Douglas Drive and 42nd Avenue (Almsted’s), along Douglas Drive (Milton’s, Pizza Hut, Aquatropics) and along 36th Avenue toward Robbinsdale (Cub Foods) are also part of Ward 2. For representation and voting purposes, Crystal divides the city into 11 precincts, 4 wards and 2 sections. There are two or three precincts per ward. There are two wards per section. Ward 2 has three precincts, and is a part of Section I. Want to know which Precinct/Ward/Section you live in? Check out the Secretary of State’s website.